For more than one and half years, I have been dealing with chronic urticaria, commonly known as hives. For the full story, read about my experience with chronic urticaria. I would get hives when my body heated up (whether I was exercising or drinking wine). 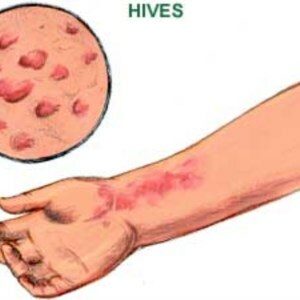 The most common place for hives to pop up were the top of my hands and on my arms. At it's worst, I would also get hives on my face (though rarely around the neck). I saw an allergist at Palo Alto Medical Foundation in Palo Alto (they have many locations now) about 2 to 3 times where they prescribed over-the-counter antihistamines and at my last appointment ran lab tests. The anti-histamines helped, but in my mind was only a band-aid fix that treated the symptom, not the root cause. I was unhappy with that solution and not thrilled about taking 5-6 anti-histamines pills a day. At my last appointment, I finally convinced the allergist to run lab tests on my blood, which showed I was mildly allergic to shellfish. I had never been allergic to any sort of shellfish and was bummed I couldn't eat my favorite crab and lobster. I've been married for more than 3 months now. After marriage and moving in, I changed my eating behaviors. Out were the ways of weekly cooking on the weekends (to better utilize my time with a full time job and part time school). For the past 3 months, I've been cooking dinner daily, with the same healthy mix of vegetables, meat, (fish and poultry) and grains. If I had to guess, this made the biggest difference in my quest to cure my chronic urticaria. Note, it did take almost 3 months of healthy eating before I noticed a change. I avoid most shellfish. Other than special occasions, I'll only eat shellfish as a way to experiment on if my urticaria is improving. The first time I noticed improved urticaria symptoms was at a seafood buffet while I was on my honeymoon in Bora Bora. I had tons of shrimp, crab, lobster, and clams, but zero reaction. I was surprised and this was the first time I noticed an improvement. The allergist recommended I avoid exercise because it "activates" the urticaria. Because I didn't want urticaria to change my lifestyle, I ignored it and actually began biking 5 days a week to work. After each bike ride, I got hives on my hands and arms. It was always worse on the afternoon bike rides when the weather was warmer. The allergist recommended I do daily soaks. I whole body was to be soaked in a bathtub with lukewarm water without adding soap for 20 minutes everyday. Thought this did help, I only noticed changes when I did the soaks. Soaking was a big time commitment and required a large use of water. I thought that perhaps drinking water from tap (filtered through my refrigerator) might contain contaminants (since I live in the South Bay of Silicon Valley). After getting hives, I got paranoid of EVERYTHING. For a long while, I was drinking only bottled water. I have since switched back to the tap from the refrigerator after not seeing an improvement. One thing I wanted to try, but haven't gotten around to trying was changing out the detergent I use in my clothes. I've always used Tide's brand detergent, but had for the past few years been using Costco branded detergent. What I've learned from my past six months is that any change can take months to fully test. Also, if something is wrong, your body will tell you one way or another and it should not be ignored. As a guy, it is common to ignore small aches, but this can lead to much bigger problems in the future. For now, my chronic urticaria is not fully cured, but I would say is 80% cured. I'm much happier today without doing soaks and taking anti-histamines.